Project management has grown up alongside modern business management as a vital skillset and career niche. The complexity of business initiatives today, both enabled and constrained by the realities of technology, financing, time, and staff, requires highly trained executives who can whip out a Gantt chart or run a stand-up meeting at the drop of a hat to keep everyone on track. Getting that training means getting an MBA with a specialization in project management. But picking an MBA program out of the nearly 1000 that are currently taught in the United States is a major project by itself. And it’s a project with serious consequences; an MBA from a top ten business school will run well into six figures, and even more affordable programs are pretty pricey. That price that can be well worth it. A degree from the right school hanging on your office wall can dramatically improve your career and salary prospects, sending you on a trajectory to the C-suite or onto top management tracks at the largest companies. But the wrong choice can leave you buried in debt and leave hiring managers unimpressed. If you have a talent for project management, then you probably have a pretty sophisticated approach to picking your MBA program. Spreadsheets, notebooks, a lot of sticky notes, right? It’s okay, we’ve got you covered. 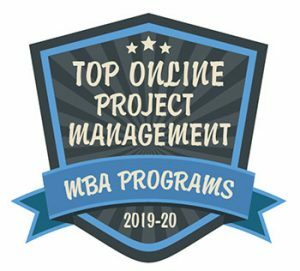 You can skip all that and rely on our list to provide you with the best online MBA programs in project management out there. We launched our own project to identify those schools. And where we started was with program and business school accreditation. You probably already know that any credible university in the United States has earned accreditation from one of the major regional or national accrediting bodies recognized by the Council for Higher Education Accreditation (CHEA) or the U.S. Department of Education (USDE). That’s a good starting point, but in business matters, it doesn’t go nearly far enough. There are a lot of business-specific education issues that a university-level accreditor just doesn’t know or care about. There is a fundamental difference in the way these agencies approach accreditation: they look exclusively at business schools and individual business programs, not the entire university. It’s the job of these organizations to drill down on standards and practices relevant to business education and evaluate things like quality of instructors and their level of industry experience, the way course content is developed and disseminated, and the research and teaching practices of the school. That stamp of approval puts these programs a cut above everyone else right from the word go. We didn’t just stop at accreditation, though. Project management is a more specific skill set that deserves a closer look. It’s true that you do need a great basic business education, and that’s where we started. Every one of these programs turns out top-flight MBAs. We looked at the core education in accounting, finance, strategic planning, marketing, and leadership skills before we even touched the project stuff, and it’s all solid. Then we got into the project management parts. We preferred schools that have some connection with the Project Management Institute (PMI), the industry-standard certification agency that offers the PMP and CAPM certifications. Best were those that both prepare you for those certs and allow you to take the exams as part of your studies, getting you out the door with both a diploma and an in-demand certification. Programs that check this box were easily in the running for our list. We also looked for schools that had strong technology or engineering programs tied to the business school. The nature of project management today involves working with software developers or engineers, serving as a sort of translator between their rarified areas of expertise and the more conventional parts of the company. The sooner you are exposed to and can learn their language and mindset, the more effective you will be in your professional project management role. This is something we feel is important enough that we gave it strong consideration to when making our final selections for this list. Finally, we looked for programs that offer a little something extra. You don’t always know what that is when you start your search, but you know it when you see it… an innovative team-teaching approach that puts you in contact with multiple instructors for a single class, maybe, or an international immersion experience that puts you on the ground in another country to learn new ways that other cultures use to handle common problems. We also looked at the flexibility the programs offer. All of these have at least some elements that you can take online, whether you need to do so to fit classes in with your busy personal and professional life, or if you just don’t want to be commuting to school all the time. You’ll find details on each program that made our list that covers all these points and more. We’re confident you’ll also find the best project management MBA for you among these schools. Six-week courses, taken one at time, in a fully online format is at the heart of Ashford University’s MBA in Project Management, a truly comprehensive course of study that’ll provide you with in-depth study in the areas of quality assurance, procurement management, and integrated cost and schedule control. In addition to a solid MBA core, you’ll dive deep into areas like project planning and life-cycle management while learning about the latest in project management software and technology. As an online student here, you’ll enjoy outstanding support and a dynamic learning environment, including 24/7 tech support, an online learning platform that allows you to access your classes on your smartphone, tablet, or laptop, and a learning support team who is there to guide you throughout the process. Want to sample online learning before you commit? Visit the Ashford Experience, an opportunity to explore the online learning offered there. Ashford University is accredited by WASC Senior College and University Commission (WSCUC), 985 Atlantic Avenue, Suite 100, Alameda, CA 94501, 510.748.9001, www.wscuc.org. Collaborative learning, student interaction, and work-related experiences are just the beginning of what Albertus Magnus College’s MBA in Project Management can offer adult learners like you. This comprehensive, fully online course of study features accelerated, eight-week classes and five start dates per year for the best in convenience and practicality, while the optional “Flex” program allows you to complete both blended and online courses throughout the program. Other reasons you’ll love the MBA in Project Management? Small class sizes, an accessible and supportive faculty and staff, instructors with real-world experience (all project management courses are taught by PMP certified project managers with real-world experience), and a diverse student body. You’ll also benefit from an asynchronous course delivery, which means you’ll be able to study wherever and whenever it’s most convenient for you. Choose the Project Management concentration and in addition to a solid MBA core, you’ll explore topics like organizational development, entrepreneurial development, and operations management and hone your project management skills through the completion of a professional portfolio designed to document your existing and future project management experience. As a student of this program, you’ll be assigned a project management mentor who will guide and advise you throughout the program—and beyond. The world of business is becoming increasingly complex today, and complexity demands iron-clad organization and management skills. When undertaking almost any business endeavor, that means finding and hiring a highly skill project management professional. And if you take the University of Hartford’s MBA with Project Management Concentration, that’s exactly the sort of executive you will be. The coursework aligns with the Project Management Institute’s best practices for Project Management Professional and Certified Associate in Project Management credentials, so you know that it is woven tightly with the most current standards in the field. With concentration electives in Six Sigma Principles and project risk management, you’ll have the qualifications that companies are looking for when staffing up big projects. And with the rock-solid core business skills that come from the base MBA program, you’ll have the knowledge to tie everything together to deliver business value on time and on budget anywhere in the world. Program is located within the Donald R. Tapia School of Business, the largest Catholic business program in the U.S.
Saint Leo’s MBA in Project Management is for emerging business leaders like you who are looking for an MBA that’s both robust and convenient. This comprehensive program is located in the Donald R. Tapia School of Business, the largest Catholic business school in the U.S. that’s been ranked among the top in the nation for its enrollment and academic excellence. In addition to strong and robust MBA core, you’ll explore areas like leadership, enterprise resource planning, and entrepreneurship, alongside advanced topics in project management like strategic management, and initiating, planning, and executing a project. You’ll also have access to a wide array of professional development opportunities, such as preparing a research paper for presentation at a national conference, completing an internship, and participating in professional memberships. Choose the MBA in Project Management and you’ll study under an esteemed faculty of experienced professionals, and you’ll have the flexibility of studying wherever and whenever it’s most convenient for you. Although project management can be applied to any sort of complex corporate undertaking, the reality today is that most projects are technology projects. That’s true even when the overarching project goal isn’t technological—information technology is critical even to managing more mundane projects. So it’s important to pick a school that has a firm grasp of information technology when you look for a project management concentration in an MBA program, and American InterContinental fits the bill. We also highlighted their technology management concentration, based on the quality of instruction and the school’s overall expertise. You get all the same advantages in the project management concentration, even as you learn the ins and outs of project scoping, risk management, and continuous improvement processes. The curriculum is all lined up with the Project Management Institute’s Project Management Body of Knowledge (PMBOK), which sets you up nicely for a PMI certification after graduation. Grantham University’s MBA in Project Management offers a fully online course delivery, the option of a standard (one course per term) or accelerated (two courses per term) curriculum, an in-depth examination of strategic analysis and planning, organization framework and risk, and integration framework, and a comprehensive course of study in business, including finance, financial and managerial accounting, human resource management, information management, organizational behavior, and more. You’ll also benefit from accelerated, eight-week classes, monthly course start dates, one of the lowest tuition rates in the nation, and a focused curriculum that prepares you to achieve the Project Management Professional (PMP) designation. As an online student here, you’ll be assigned a student advisor who will ensure you have what you need to experience success in the program. Other student resources available to you here include academic support through Grantham’s Teaching and Learning Center and student support through the Student Success Partners program. The UL MBA program offers a high-quality graduate education that will give you the skills you need to either progress in your current position or to make a career change that will lead to success in executive leadership positions. Project management is a particularly versatile specialization to earn in that respect because almost every industry and every function in today’s complicated business world requires project management expertise. With a solid foundation in IT management, economics, and business policy and strategy formulation, you’ll layer on advanced courses in organizational behavior and analytical planning techniques to give you the skills it takes to keep times on track and on budget through any challenge. Capella’s MBA is a solely online program, and they’ve learned the secret to success lies in data. That’s a secret they are happy to share with their MBA students through a curriculum that is heavily focused on rigorous analysis and using data-driven decision making to improve your business influence and problem-solving skills. With specialization courses in procurement and budgeting, you’ll get an early handle on some of the most important aspects of project management. You’ll graduate from Capella well-prepared to wield advanced analytical and decision-making skills to make your organization more efficient and deliver projects on-time and on-budget. The MSU online MBA with a concentration in project management brings all the usual goodies to the table in terms of online MBA programs: flexibility, affordability, great access to instructors and course materials from any location. And you get all the usual helpings of financial, accounting, and leadership education from knowledgeable professors with an interest in seeing you succeed. But that’s where all the typical servings end and the secret sauce begins. The project management concentration is built around a unique curriculum designed in concert with professionals in Industrial Engineering to create an engineering-focused MBA specialization that few schools can match. Additional courses in quantitative analysis, process improvement engineering, and industrial quality control give you a leg up as an executive in any major manufacturing business in the country. Missouri S&T programs consistently emphasize management in a fast-changing, competitive global environment through the applied use of information technology. So it makes a great deal of sense that one of their best MBA specializations is in the area of information systems project management. IT projects have presented unprecedented challenges in project management circles and require their own unique and specialized approaches to keep on track and on budget. Where most project management concentrations go broad spectrum and try to generalize their lessons, the certificate option at Rolla cuts straight to the complex heart of IT project management with training requirements analysis, scheduling, quality assurance, and testing. Concordia University Nebraska’s MBA in Project Management is where you’ll gain the skills and knowledge needed to serve as an effective and ethical leader in your field. And its online delivery is your solution for earning your MBA while continuing to meet your professional and personal obligations. Delivered through innovative experiences taught by a faculty of experienced professionals and consisting of courses in business analysis, modeling, and analytics, this fully online program features a curriculum that easily translates into the real world and qualifies you to take the Project Management Professional (PMP) exam. Get started on your MBA in Project Management with help from Concordia’s superb team of enrollment specialists who will guide you throughout the course enrollment process and then begin working your way through this program’s accelerated curriculum, which features manageable and convenient, eight-week classes and a self-paced course of study. Ramapo technically doesn’t believe in offering MBA specializations; in their view, a broad-based education in the essential elements of business management takes precedence over any sort of narrow focus into a particular field. But there’s a secret concentration of a sort buried in the Ramapo program: the Project Management option puts you through all the required paces outlined by the Project Management Institute (PMI) to sit for either the CAPM (Certified Associate in Project Management) or PMP (Project Management Professional) exam by the time you’ve concluded the second year of the program. Even better, Ramapo is a registered education provider with PMI, so you know their curriculum and methods are up-to-date. The MBA in Project Management at the University of Mary is at the intersection of value, convenience, and academic excellence for adult learners like you. This fully online program, which can be completed in just 20 months, is designed to prepare you with the advanced knowledge and skills necessary to succeed in management and leadership positions in project management. Courses in this program start every five weeks, year-round, so starting your MBA is easier than ever! And, thanks to the state-of-the-art online learning platform, Canvas, you’ll be able to collaborate with your peers and communicate with your instructors, all from the comfort of your home. The concentration in project management will help you achieve leadership positions in any industry, thanks to in-depth study in areas like project planning, project initiation, and project execution and control. Ashland offers a lot of concentration options to cater to almost any career choice an MBA student might want to make, but it’s clear from the outset that the Project Management specialization is the clear winner. With dual-purpose coursework that meets PMI standards for approved preparation for PMP certification, you can graduate with advanced industry credentials in hand already. The project management specialization is the only one that the school offers in an accelerated online format, which tells you that the class options are plentiful and fully staffed. You are taught by the same professors who handle all in-class education, so there’s no concern about getting a second rate instructor. Although you won’t go wrong with any concentration option at Ashland, a project management specialization bring the best bang for your buck. Practicality, ethics, and quality are the focuses of the OCU MBA program. In the Project Management specialization track, that results in a curriculum that covers both technology and traditional projects, using time-tested, proven statistical, communication, and assessment techniques. You’ll cover the background of scientific management techniques so you understand how the field of project management has evolved as an integral part of the theory and practice of business. You’ll also get an education in quality assurance and control concepts and methods, so the projects you do manage will achieve their goals on time and on budget. It all comes on top of a solid core of traditional business courses in accounting analysis, financial services, and leadership that will position you to take on top executive positions with extensive project portfolios in any industry. Concordia views their role as preparing the next generation of business management. A lot of change is coming in the business environment over the next few decades, so that means baking in a lot of initiative, flexibility, and ingenuity to the MBA program… all excellent attributes for the project management role. Concordia’s project management concentration builds on those core elements with additional courses in quantitative and qualitative reasoning, risk management, and strategy implementation. You’ll get the full range of skills and familiarity with the tools of the trade to prepare you to step right into a high-level project planning and leadership position. Robert Morris has redesigned their MBA program to adopt pedagogical best practice for teaching real-world techniques and practices both online and on the ground. The project management concentration sends you out the door with a 12-credit certificate specific to project management skills, focusing on realistic tools to deal with project management roles and environments. You’ll learn about project life cycles, work planning, and how to achieve project objectives in the face of challenges and obstacles through analytical decision-making. Interested in an MBA program that not only offers up the best in academic excellence but also provides adult learners like you with the convenience and flexibility you need? Then look no further than Waynesburg University! Their MBA in Project Management features a fully online course of study, convenient, eight-week courses, and six start dates throughout the year for the best in convenience and flexibility. Take just one course at a time and you’ll graduate in two years. Take two courses at a time and you can go from MBA student to graduate in just 12 months! The choice is yours! In addition to a solid MBA core that focuses on management and leadership skills, you’ll explore a wide variety of topics in project management that will arm you with the knowledge and skills needed to lead projects and programs in your field. Affordable, convenient, and comprehensive—National American University’s MBA in Project and Process Management has everything you need in an MBA program…and more. A fully online course delivery allows busy, working professionals like you to earn your MBA while still maintaining your professional responsibilities. And from academic assistance to a highly engaged faculty to career assistance and beyond, earning a degree from National American means you’ll always have the support you need to succeed. In addition to a solid MBA core, this program will prime you for success as a business leader who can deftly plan and control organizational development and procedural activities. Everything about the UHD MBA program screams practical application; from the team-teaching technique that puts a corporate fellow in each class to the corporate-driven curriculum planning, every course oozes real-world applicability. That’s why the project management concentration option is so special. It’s not just about project management, because companies are starting to realize that even though it’s important to have skilled project managers to hit time and budget numbers, it’s even more important to look past a single project and see into the processes and patterns that repeatedly drive those projects. At UHD, you’ll learn how to visualize those patterns and seek out inefficiencies to drive smoother, faster, less costly operations throughout the organization. With skilled practice in root cause analysis, lean operations, and Six Sigma, you’ll get all the tools you need to take your core business skills and apply them not just to a single project, but to the underlying organization of every project in the company. That’s talent that companies are hungry for, in Texas and beyond. Norwich has been cranking out top business leaders for nearly 200 years. With a reputation like that, you don’t have to worry about the quality of the education you’ll get there in the core business elements of finance, marketing, and operations. And since the project management concentration has the prestigious accreditation of the Project Management Institute’s Global Accreditation Center for Project Management Education Programs (GAC), you also know that the project management tools, techniques, and practices you’ll learn are closely aligned with PMI standards. This means you’ll be all set to earn your PMP (Project Management Professional) or CAPM (Certified Associate in Project Management) certificate after graduation. But the specialization is about more than just a few pieces of paper. You’ll also participate in a required Independent Research Project that will pit your new skills against a real-world corporate case study to give you the practical, hands-on experience to cement your expertise. Liberty University has been one of the pioneers in remote education programs since the days of shipping out VHS tapes in padded envelopes, so if you are looking for a rock-solid, comprehensive MBA degree with a project management specialization you can take online, look no further. Close adherence to Project Management Institute (PMI) standards in course work means you’ll get expert preparation for sitting the CAPM certification exam as soon as you graduate. You’ll get a top-down view of all the integral aspects of project management to business, including project team leadership, assessment, and project performance. A strong focus on the human relations and motivations of staff give the Liberty program a human touch that gives graduates a focus on team empowerment rather than old-school whip cracking. Northwest University integrates Christian faith with relevant, practical business training that you can apply immediately in work and in life. With a program designed with the flexibility and convenience to aim it squarely at currently employed professionals looking to improve their business credentials, this can offer a big boost to your career long before you graduate. Faculty who have built and managed businesses themselves guide you along a familiar path in courses that range from international business to corporate strategy. The project management concentration zooms in on the complexity of putting together systems and products in the modern business world. Communications and organizational management courses give you a powerful background that will attract major employers to your resumé like sharks to chum. The MBA in Project Management through Herzing University is where you’ll gain the skills in leadership, management, and problem-solving required to serve as an effective and ethical leader in today’s dynamic business environment. Thanks to a robust curriculum that’s focused on the practical application of current business problems, you can be sure your classroom learning will easily translate into the real world. In addition to a robust MBA core that’s focused on critical thinking skills and business acumen, you’ll examine in-depth topics in project management like project cost, risk management, and business analysis and gain the skills necessary to develop a detailed project management plan. Plus, you’ll gain the education needed to sit for the Project Management Professional (PMP) and Professional in Business Analysis (PMI-PBA) industry designations. Just a few of the perks of pursuing Herzing’s MBA in Project Management include: an accelerated course of study that allows you to go from student to MBA grad in just 14 months…a curriculum complemented with real-world scenarios…an esteemed faculty of certified Project Management professionals…and the opportunity to complete the program on a full- or part-time basis. Want to add another dimension to your MBA program? Consider pairing the Project Management concentration with another concentration by choosing the dual concentration option.